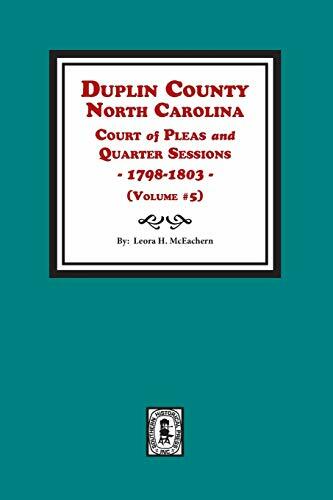 Duplin County was formed in 1750 from New Hanover County, NC. It is located in the Southeastern section of the state and is surrounded by the counties of: Jones, Lenoir, New Hanover, Onslow, Sampson, and Wayne. In these abstracts, one will find local office holders being appointed, the levying and expenditure of local taxes, selecting & summoning of juries, licenses being granted to operators of taverns, as well as deeds & bills of sale being acknowledge by the grantor. The Court also oversaw a wide range of matters involving estates, including probate of will, settlements of estates, and appraisement, as well as matters dealing with bastardy, and many other valuable bits of information.